Come along and browse stalls, grab an egg and bacon sandwich for breakfast or a sausage sizzle. Enjoy one of Coffs coast’s popular community markets. Stalls are available for hire, no booking required, just turn up early and claim a site. Sites of 6m x 6m costs $10 – we will be around through the morning to collect site fees. Most sites are filled by 6am. No hot food or drink stalls – thanks. 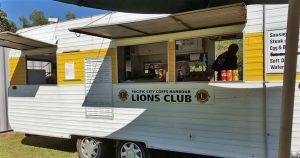 Or why not enquire about joining Coffs Harbour Pacific City Lions Club.